The Curaplex® AccuPAP Positive Airway Pressure Device is an innovative treatment option used to provide positive airway pressure during lung volume expansion therapy. Indicated for the prevention and treatment of atelectasis, AccuPAP can aid in reducing air trapping in asthma and/or COPD patients as well as optimize delivery of bronchodilator medications. Unlike other positive airway pressure devices, AccuPAP is designed with both the clinician and the patient in mind. 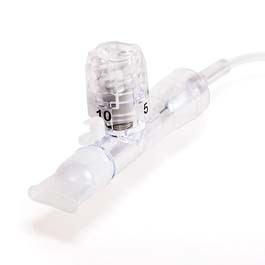 Simply connect the device to a flow meter, set the flow meter to 10 lpm, adjust the pressure valve to the desired pressure and instruct the patient to breath normally. AccuPAP delivers consistent, accurate pressures, whether as a standalone treatment or while delivering aerosol medications, and because the pressure valve is clearly marked, no manometer is necessary. With AccuPAP, you can help your patients reach their tidal volume goals in less time and with less hassle!